Place two cups of bulgur in a bowl and add two cups of water. Let the wheat absorb the water (20 minutes). When ready, fluff it with a fork to separate the grains. Pour the wheat into a large salad bowl and add the tomatoes, cilantro, mint and onion. Mix the ingredients and dress with lemon juice, olive oil and salt. Toss together and serve with pita bread or as a side with grilled meat, on top of a green salad or as a fill-ing for stuffed avocado. If you can’t find fresh mint, you can use dried mint instead. My family really enjoys eating salads, especially when it’s hot outside. This tabbouleh salad that I grew up with is a tradition in my home and it’s a great dish for summer vacation. 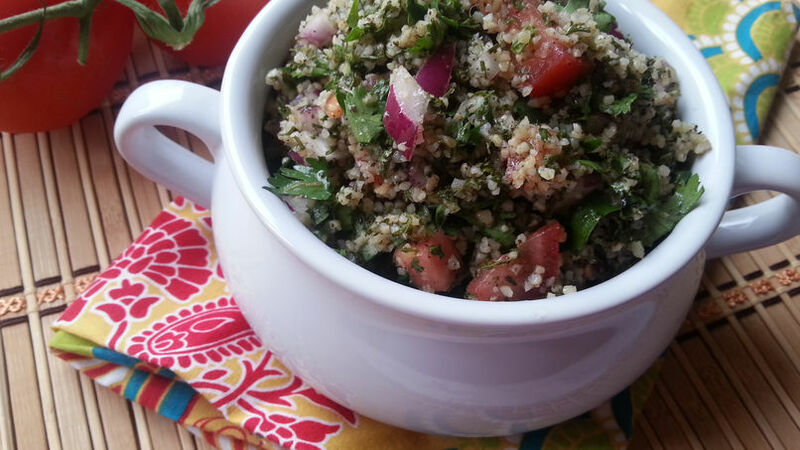 Tabbouleh is a Mediterranean salad made with wheat, tomatoes, onion and mint, and served with hummus and pita bread. It’s a truly delicious salad that satisfies everyone, and now I want to share my special recipe with you.